Defeat Escheat with some helpful tips and compliance best practices.  Reporting unclaimed property is anything but simple. It is a complex year round process that requires significant time and commitment from your organization’s internal resources. With 55 jurisdictions and varying laws between them, it is imperative that your company is fulfilling its unclaimed property obligations. Failure to comply with these laws can ultimately lead to costly fines, penalties, and audits. Would you rather read the transcript? Click here to download. This session will be led by Laurie Andrews of Keane’s Unclaimed Property Consulting & Advisory Services Division.